Every startup begins with an idea. Entrepreneurs are innovative people: whether they’re inventing a new technology, branching out into a new industry, or using a new business model, there’s always a factor of newness in entrepreneurship. But, just because your idea is new doesn’t necessarily mean that it will succeed! Your idea needs to fit inside of a market opportunity and be ready to grow as the markets evolve. What is a market opportunity? Well, if you have an idea that no one will buy, there isn’t an opportunity in the market. A market opportunity is a white space in an industry where there’s potential for customers and incoming money. But here’s the trick: if you’re doing something really cutting-edge, there may not be a market for it yet! Here is where it’s important to also understand how the market will evolve. Some entrepreneurs are true visionaries in this sense; they can see an opening market before it exists. This was the case for the first smartphone technologies: no one knew what a smartphone was, or that they wanted and needed one, before the industry began to grow. But there were visionaries that saw it coming. This lesson is going to explore how to examine market opportunities and understand their evolutions. Without an understanding of the markets, your business may not find its niche, or it may be edged out by newer ideas in a short period of time. 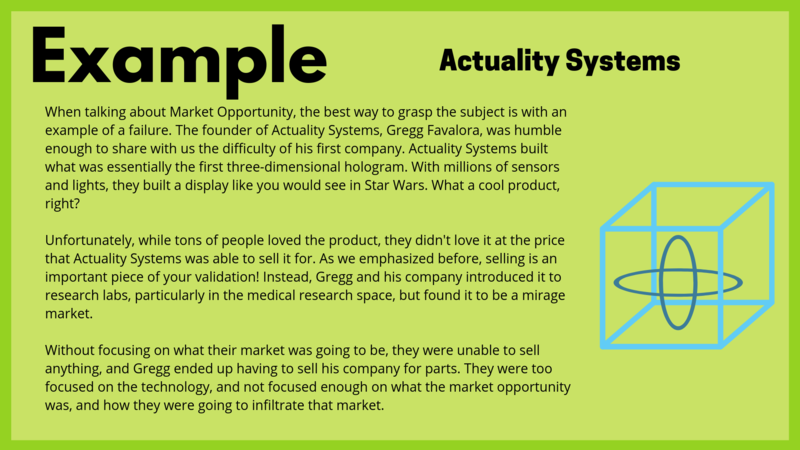 There’s a basic way of thinking about a market opportunity, and a more complicated one. The most basic way of thinking about market opportunity is this: the market is what the market is. Every entrepreneur should have an idea of what their market looks like: how many customers there are, where they are, how much they might be willing to spend on the product or service, and how much market penetration the entrepreneur can really achieve. There are two ways of identifying market opportunity in this basic sense: the top-down approach, and the bottom-up approach. These are based on the individual and subjective senses of how “realistic” your customer base is. For more on being realistic as an entrepreneur, check out our lesson on realistic optimism. The top-down approach looks at the industry, the number of players, and the competition, and then assesses and measures how much of the market the startup may realistically capture. How much can you sell into a single customer? At what revenue? How long will these customers remain customers? How many customers are there that you can realistically sell this to? Both top-down and bottom-up approaches require you to think about your paths to attacking your market in smaller chunks. Here, we’ll bring in one of our favorite Startup Secrets again: focus. When you think about market opportunity, the first thing you should think about is focusing! Lots of entrepreneurs think they have a huge market opportunity -- and you might! But if you go after it all at once, it’s like trying to boil the ocean. So, your first step when approaching a market is to start small. Pick a smaller segment, and possibly even a unique and unaddressed one, that you can tackle first. Once you corner a small part of the market, you can expand from there. For more about how to navigate your small segments, see our lesson on Adding to Lean Startup Thinking. Now we can delve into the more complicated way of thinking about your market: how big of a market is big enough? One of our favorite secrets here is if you’re going to pick a fight, pick a big fight! When considering “how big is big enough?”, you should examine what you think you’ll need to get your company off of the ground. If a company is going to take $100+ million to get off the ground (think Tesla! ), you better be looking for a big market! You need to think about whether or not you’ll be able to generate returns for your investors. However, if a market is worth $5 million or $10 million, does that mean it’s not a good opportunity? No! Smaller markets are also great for products, but it should correspond to how much you’re asking for when fundraising. To learn a little more about deciding what to fundraise, head over to our lesson on How Much to Raise and When. But especially if you can bootstrap your business, you’re might be able to move into a smaller market and dominate much more easily. Check out our lesson on non-equity fundraising for more on bootstrapping, and explore this idea of market values and fundraising in our forums. Why are you creating this product now? What market has a gap? Are there market dislocations that give you a white space? Are there forcing events* that are opening up a new opportunity? Are buyers changing their behaviors towards a market? *Forcing Events are outside factors, completely outside of control, that create new opportunities. For example, natural disasters are forcing events that open opportunities for “storm-proofing” critical infrastructure and creating more durable materials. New reporting requirements that are government-regulated would create opportunities for reporting compliance processes and software. Check out our lesson on the 4U Framework for more on forcing events and how opportunities can be qualified. 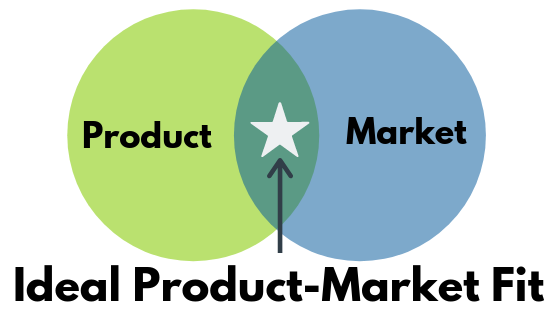 Your product has to fit into your market to succeed. You have to be careful about figuring out if your product fits well into your market; lots of entrepreneurs get caught in what we call mirage markets. Mirage markets are markets that seem real, but often don’t work out in the real world. Think about research labs: they often experiment with products and tools, but end up not buying them - they’re using these in their research, but can’t find a practical application. That means they’re not customers, even if they’re experimenting! This is the same difficulty with freemium models: people may use a product when it’s free, but if they won’t spend money on it, you don’t have a business! Your market validation always has to exist in the form of customer dollars. Now, let’s say that you have a product that doesn’t have a huge market opportunity right now, but you see one coming in the future. Some of the most successful visionaries of all time got behind huge trends before the market had evolved to reflect that; from Ford Motor Company to Apple, there have been entrepreneurs who saw markets coming and started building their products before they were ever popular. There are some great upsides to this: if you can discover one of these trends, and get lucky enough for it to grow rapidly, you can be wildly successful. There are also ways to ground your predictions in externally-validated metrics that will help you mitigate the risk. Unfortunately, there are also downsides to market evolution! No one really knows how the market will evolve, and those that are able to carry out their predictions are often just lucky. And, market evolutions are such that even if you have a huge opportunity now, the market might evolve for that opportunity to disappear in just a few short years. Make sure that these metrics are customer-based! If you have customer-based metrics to validate your progress, you will know whether you’re on track to be a feature, a product, or a company. Additionally, make sure you have a vision for your company that doesn’t get pulled down an outlier customer’s roadmap. If you feel like you’re going down a path of creating features just for one customer, take a step back and ask yourself: what does the entire marketplace look like? How will this marketplace evolve? Ultimately, market opportunity and evolution are soft sciences with some hard foundations. Predictions, evolutions, and successes are largely based on luck, with some solid visions and customer metrics backing them up. Don’t be afraid to reach for markets that don’t exist yet! But also expect some pushback from investors if you’re branching out into entirely new territory. Work on understanding why you have that prediction, and being able to communicate it effectively. Always make sure you back your validations with customer dollars! But if you can really nail down your ideas on market opportunity and evolution, you’ll be on track to build a successful company. Have questions about market opportunities or specific industries? Head over to our forums and see what the community has to say! For more on Market Opportunity and Evolution, check out our workshop on Getting Behind the Perfect Investor Pitch. Defining your problem statement and evaluating its viability with four words.